Welcome to Austin's Cattle Company. Our menu showcases our passion for grilling fresh, never frozen steaks like our signature hand-seasoned, hand cut Prime Rib® and the "bone-in" Trail Boss Porterhouse®. And there's more on the menu than just great steaks, like expertly grilled fresh fish and fresh chicken. Enjoy specialties such as Cajun Grilled Shrimp™, Large white shrimp seasoned and grilled to perfection. Served with a side of our own Remoulade sauce; fall-off-the-bone tender Baby Back Ribs; and Santa Fe Chicken, Char broiled chicken breast, smothered with BBQ sauce, topped with bacon and melted Cheddar and Monterey Jack cheese topped with pico de gallot. Freshly made salads, soups, hearth-baked bread and irresistible desserts accompany these delicious entrees. Yes - we cater for Birthday parties, Christmas parties, Kids parties and Functions. Give us a call and let us know what you're looking for. 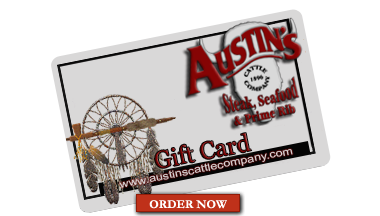 And by the way - if you're thinking of having your birthday at Austin's Cattle Company, Bring a party of 8 or more adults * Bookings Essential - Conditions Apply - ask in store for more details. ITS AN ADDICTION YOU NEVER HAVE TO QUIT! And THEY will remember you forever! Thirsty? 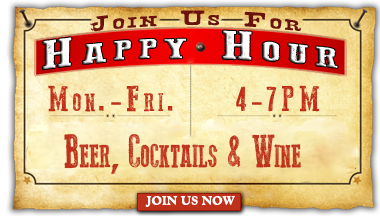 We have Discounted drinks during Happy Hour! Hungry too? Order some food for those in the mood. We have plenty of appetizers and delicious meals from our kitchen. And of course, Happy Hour wouldn't be complete without some delightful libations from Austin's Bar, like Long Island Iced Teas, Ice Cold Beer, or even a sparkling White Zinfandel.